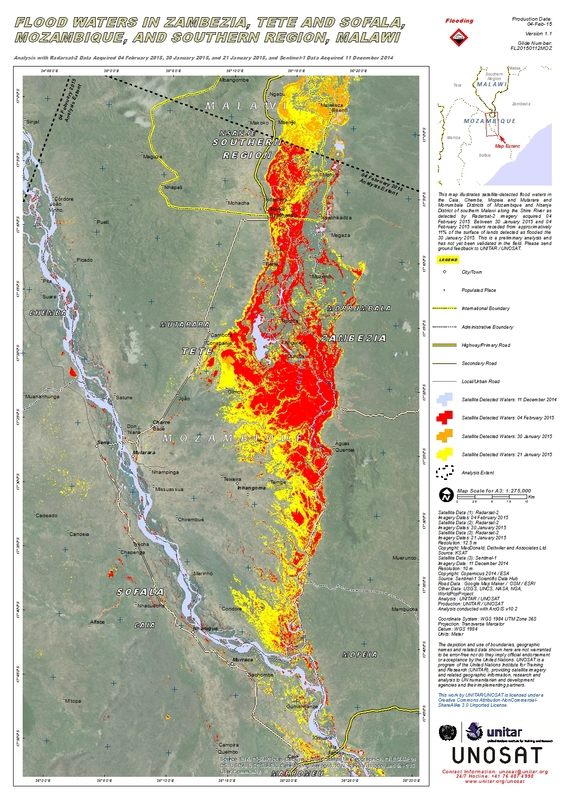 This map illustrates satellite-detected flood waters in the Caia, Chemba, Mopeia and Mutarara and Morrumbala Districts of Mozambique and Nsanje District of southern Malawi along the Shire River as detected by Radarsat-2 imagery acquired 04 February 2015. Between 30 January 2015 and 04 February 2015 waters receded from approximatively 11% of the surface of lands detected as flooded the 30 January 2015. This is a preliminary analysis and has not yet been validated in the field. Please send ground feedback to UNITAR / UNOSAT.